So sorry for the static on the blog for the past week. Things have been kind of crazy around here. I’ll get into more details in coming blog posts, but for now I just want to get right back to the FOOD! 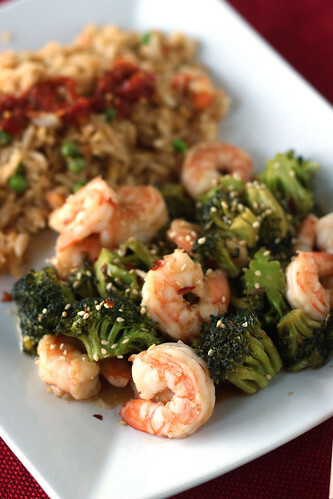 This Shrimp and Broccoli is a great take-out fake-out. It comes together quickly and taste delicious. I do want to note that the evening I photographed this meal I completely spaced and forgot to add the onions. We still gobbled up dinner, but I think I prefer it with the onions. Obviously if you don’t like onions you can leave them out and the meal will still work. Also, you can adjust the heat to suit your tastes. If you like things extra spicy you can add extra chili-garlic sauce or red pepper flakes. If you don’t like spicy things you can cut it way back! In a glass measuring cup combine the chicken broth, rice vinegar, soy sauce, cornstarch, brown sugar, sesame oil, and garlic-chili sauce. In a large wok or skillet over medium-high, heat the canola oil, ginger, and garlic. Once the oil is hot (and before the garlic starts to turn brown!) add the shrimp. Season with salt and stir-fry until the shrimp is translucent and pink, about 3 minutes. Remove the shrimp from the pan. Add one teaspoon of oil to the pan. Add broccoli and onions and stir-fry for about 3 or 4 minutes. Pour in the sauce mixture and cook for another 3-4 minutes. Add the shrimp back to the pan and cook for 1 more minute. Serve immediately with a side of rice and a sprinkling of sesame seeds. Optionally, serve with Sriracha sauce on the side. 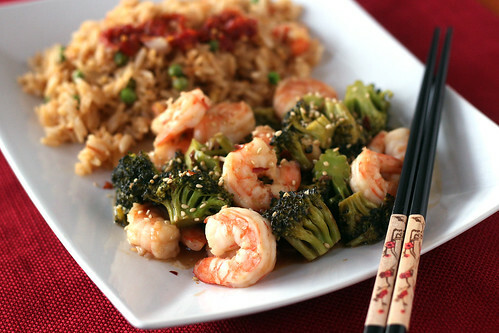 Here are some other delicious Asian-inspired flavors! 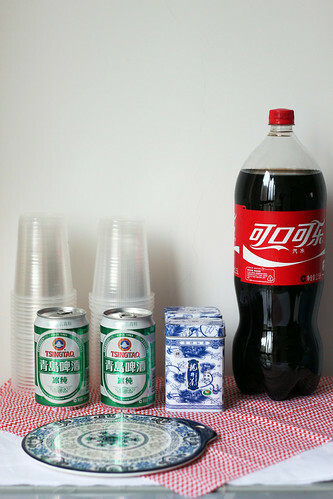 I am surrounded by delicious, authentic Chinese food and I have lots of local favorites. There is a cabbage dish at a local restaurant that I could literally eat every single day for the rest of my life. I’ve also come to appreciate and love a level of spicy unlike anything I’ve ever had in the US (seriously, not the kind of spicy that makes you sweat, the kind that literally makes your mouth go numb). And there is a green bean dish that I order at every single restaurant that has it. But sometimes…. Well… sometimes I crave American Chinese food. That’s right. I live in China and I crave Chinese food – from America. Food that is sticky and sweet and salty (kind of like the Jack Daniels Glaze). Sad, I know. I was having one of those cravings a few weeks ago, so I went on the hunt for a recipe. 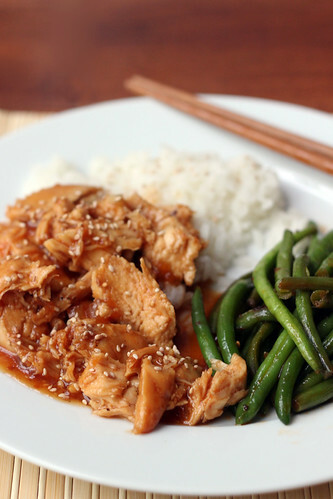 I came across this Honey Sesame Chicken and I knew it would be a winner. This chicken had all of the flavors I was looking for. The recipe originally called for using a crockpot – but I don’t have one here in China, so I just used my dutch oven and cooked it in the oven. It was still very easy and mostly hands off! I’ll include both methods so you can choose! 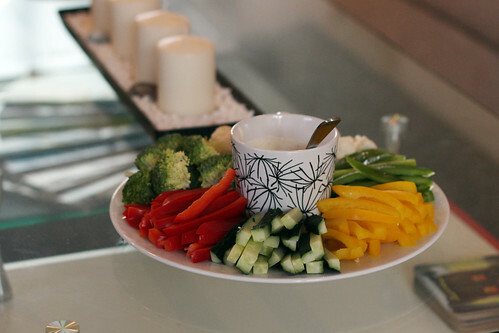 *This recipe made enough for Jesse and I to each have generous portions and left overs for lunch the next day. Season chicken with salt and pepper and place in dutch oven (or crockpot). In a liquid measuring cup, combine the honey, soy sauce, diced onion, ketchup, vegetable oil, garlic, ginger, and red pepper flakes. Pour the liquid over the chicken. Cook in the preheated oven for 1 to 1 1/2 hours (or in crockpot on high for 1 1/2 to 2 hours). Once the chicken is cooked all the way through, move to a plate and shred with a fork. Leave the cooking liquid in the dutch oven (or crockpot). Stir together cornstarch and water. Pour into the cooking liquid. Place the dutch oven on a stove-top burner on medium-high heat. Bring the liquid to a boil, then reduce heat and simmer for 5 minutes, or until thickened (stir the cornstarch/water into the liquid in the crock, leave on high and cook for 10 minutes). Return the shredded chicken to the sauce and stir to coat. 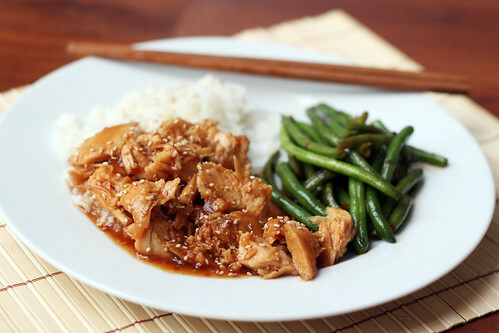 Serve chicken hot over rice with a good amount of sesame seeds. 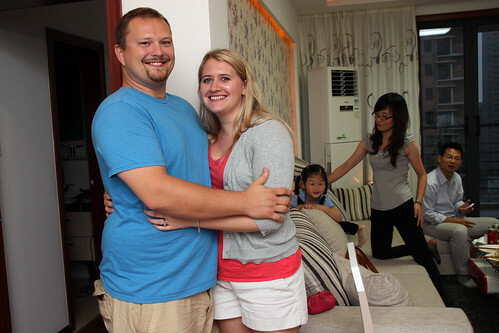 Since moving to China we have been blown away by the kindness and hospitality we have been shown. 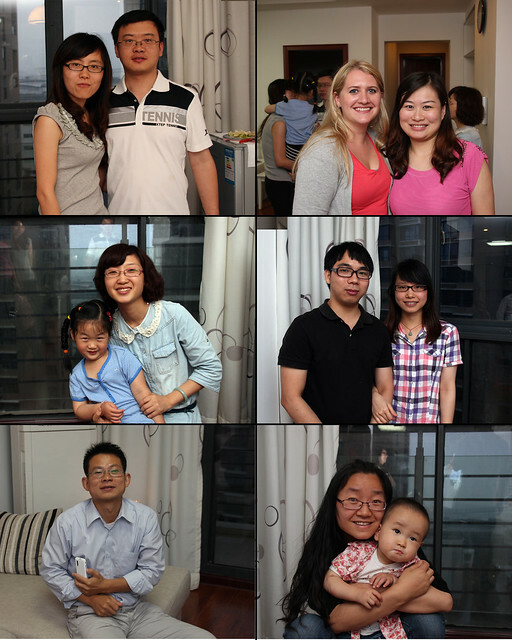 In the short time that we have lived here, we feel like we have made many life-long friends. Now that we are settled into our apartment, we wanted to have our new friends over to celebrate good friendship and our new home. An East meets West celebration. The stars couldn’t have aligned more perfectly for this event. First, I was excited to have my idea chosen by Foodbuzz for this months 24×24*! 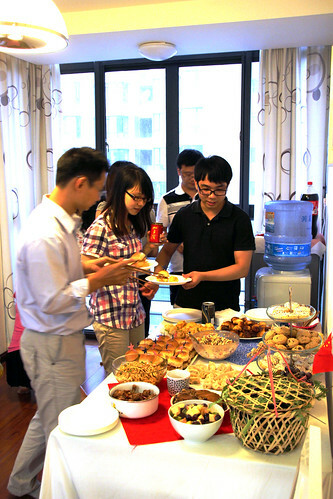 Second, the weekend we chose for our party also happened to be a holiday weekend in China. 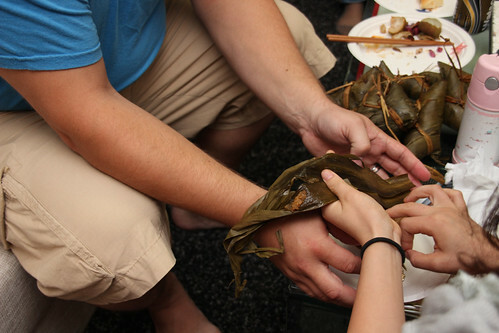 So, in addition to celebrating friends and home, we were celebrating Dragon Boat Festival (Duānwǔ Jié 端午节)! *Each month Foodbuzz showcases 24 food bloggers as they host a meal in the same 24 hours and blog about it on the same day. 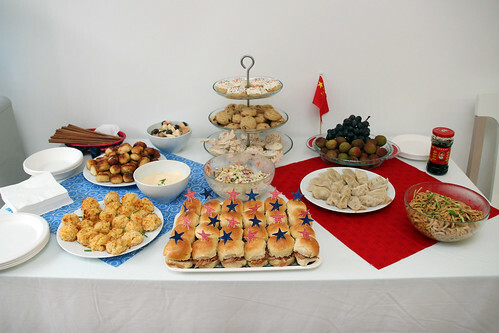 My idea for the party was to create a fusion of American/Western dishes and Chinese/Eastern dishes. 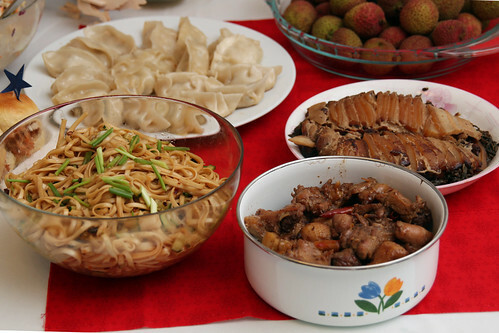 I supplied all of the Western dishes and, with the help of a friend, two of the Chinese dishes. I was also delighted when guests offered to bring traditional dishes. Here’s what we came up with! Full menu listed below the photos! The guests – minus the two people who snuck past my camera! Guests filling up their plates! I think it’s pretty safe to say that the party was a big success! 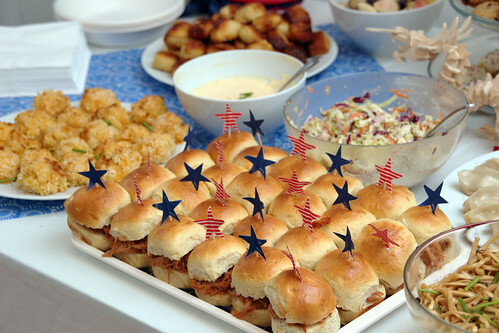 I can’t wait to host my next party! If you’ve read this little blog for any amount of time over the past year you have probably noticed that I mention China a lot. That’s mostlybecause it seems like Jesse is always there. In 2011 he was there for a grand total of almost 6 months. That’s a lot of time apart. Of course I was happy to get to spend time in China with him last summer but it still seemed like we were apart so much. Now that we know he is going to spend a significant amount of time there again this year, I’m headed back! This trip is going to be almost 2 months and I couldn’t be more excited. There are only a few weeks before I leave and I have been so busy getting ready for the trip. 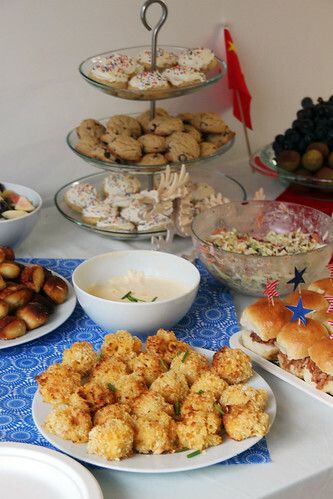 I know the food is what really makes a food blog, but I hope you’ll stick with me as I work my way through this craziness. 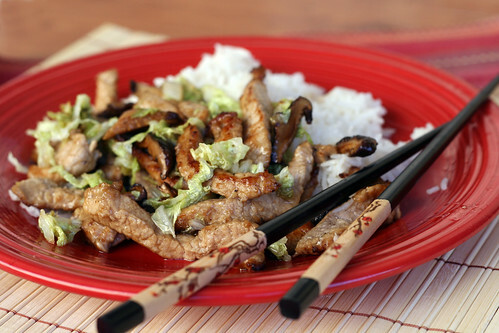 In the meantime I bring you Shanghai Style Stir-Fried Pork and Cabbage to celebrate my traveling to Shanghai. This recipe jumped right out at me as I was flipping through last months Food & Wine Magazine. Of course I was immediately drawn to the name and the picture sealed the deal for me. The ingredient list might not look that exciting and you may wonder if you should tweak it and make some additions. Trust me, it doesn’t need a load of garlic or dash of ginger. It’s one of those “less is more” kind of things. The pork is juicy, the mushrooms are savory, the cabbage is a little tangy, and it’s all brought together nicely with a simple sauce. Place the pork loin in the freezer for 15 minutes to make cutting easier. While the pork is in the freezer, reconstitute the shitake mushrooms by covering with boiling water and letting stand for 5 minutes. Remove the mushrooms from the water and press out the water. Remove stems and cut mushroom caps into strips. Set aside on a paper towel. In a small bowl whisk together the corn starch, rice vinegar, soy sauce, 1 tablespoon oil, pepper and sugar. Remove the pork from the freezer and cut into 1/4″ slices. Stack the slices on top of each other and cut into 1/4″ strips. Place the strips of pork in the sauce and stir to evenly coat. Heat 2 tablespoons of peanut oil in a large skillet or wok over high heat until the oil just starts to smoke. Using tongs, carefully add the pork strips to the hot oil. Cook for 30 seconds to 1 minute, until the pork is no longer pink and the edges just start to turn golden brown, using tongs to stir the pork to evenly cook . 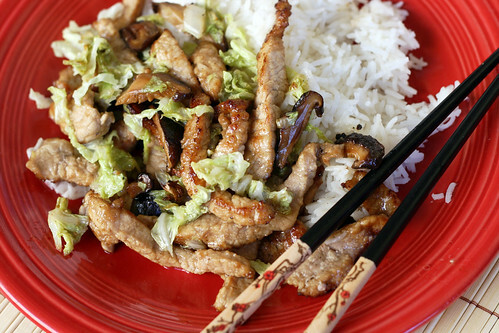 Remove the pork from the wok and set aside on a paper towel. Add another tablespoon of oil and a pinch of kosher salt to the wok and allow to heat for about a minute. To the wok, add the shitake mushrooms and half of the cabbage. Stir-fry over high heat until the cabbage has wilted. Return the pork to the pan and add the other half of the cabbage. Cook just until the cabbage is tender, but not completely wilted. Serve with rice and red chile sauce (I was so hungry I forgot to add the sauce and get a picture, don’t be like me, don’t forget the red chile sauce! ).